I decided to go for something a little more unique for a couple of my container gardens this spring. It took me a while to find the right container, but I finally found these lovely, lightweight ashen colored large containers to use. I decided I wanted bright, colorful plants to greet me at the sides of my carport — I went tropical! The neutral color of the containers I found makes the tropical plants stand out even more. The colors in the tropics seem to be brighter, more vivid, and more alive. Red, orange, yellow, and lime green imbue the feeling of the tropics – and in a container garden inspired by the plants and colors of the region – I can bring the tropics to my home, at least for the summer. 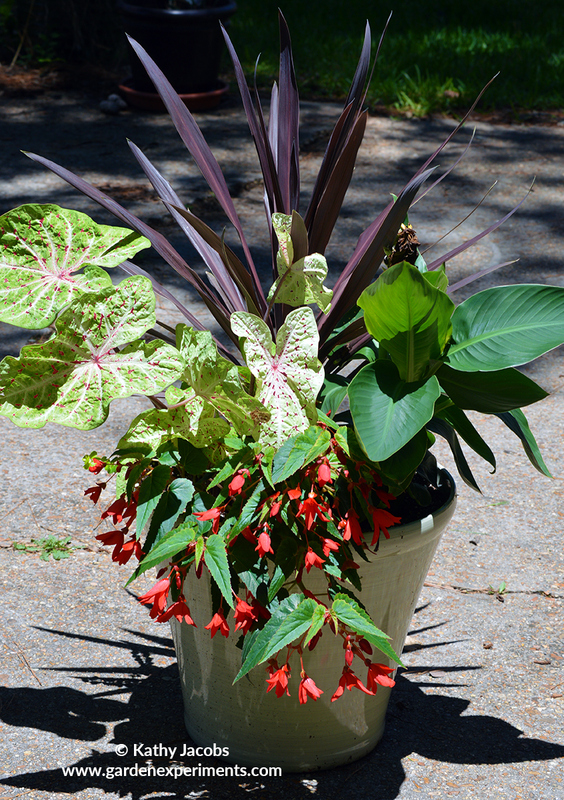 The Sweet Beginnings Caladium (Caladium ‘Miss Muffet’) with its lime green- and red-spotted leaves add some color interest and texture to the arrangement. I can dig up the bulbs and bring them indoors to overwinter them and replant for next year. Bauer’s Dracaena Palm adds just a hint of purple to the composition and adds some much-needed height as well. 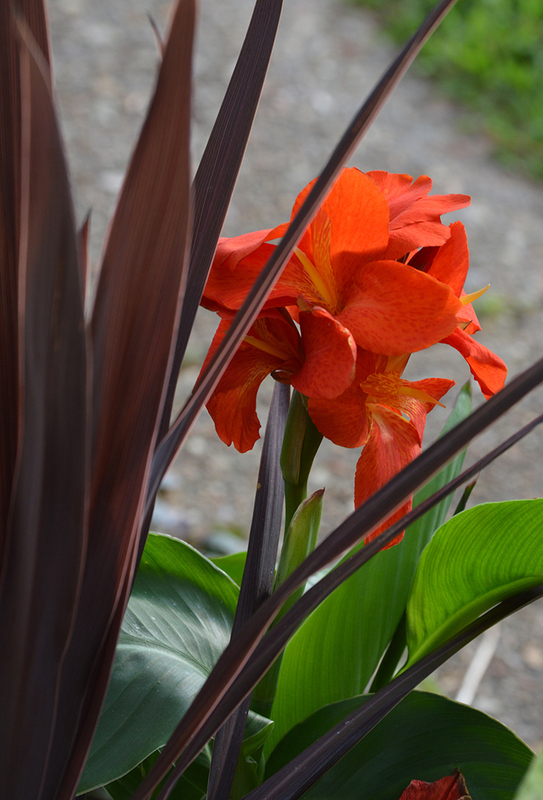 The Canova Canna Lily not only adds a strong backbone to the arrangement, but the bright red and orange flowers are a nice touch of color. Once I am finished with this container garden, I will put the canna lily into the ground where it will come back in the spring. The Mistral Dark Red Begonia (Begonia boliviensis ‘KLEBG14477’) has amazing rich red flowers with dark green, wing-shaped leaves. In the winter, this will make a nice indoor plant. At the base of the arrangement, I’ve planted gold creeping jenny (Lysimachia nummularia). Eventually, it will fill in and spill over the edge of the container. Be careful where you put this plant in your garden, it spreads quickly. In my zone 7b, it will overwinter just fine. I took a bit of a gamble on this particular combination of plants. 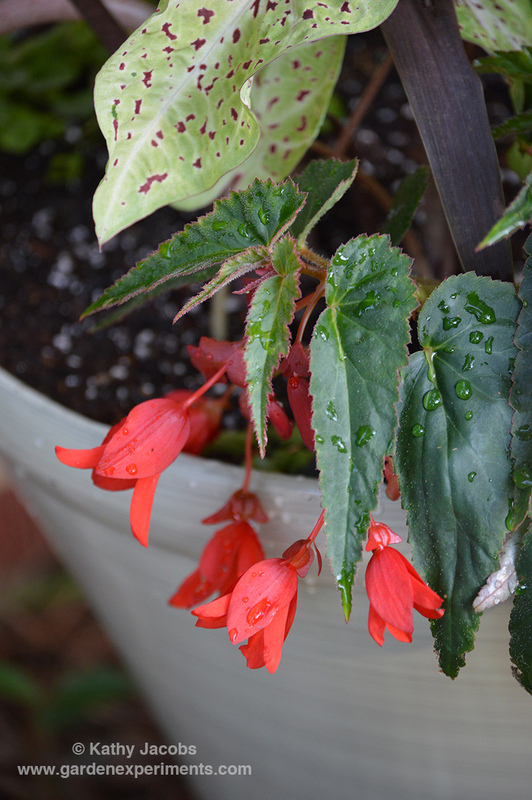 While many of the tags for the plants said 4-6 hours of sun, the begonia and the creeping jenny prefers more shade. Where I placed these two planters is right at the edge of my carport, so I will see them every time I drive home. This location gets a mixture of intermittent direct sun in the afternoon and shade in the morning. I’m not sure exactly how many hours, but I would guess it ends up being around 4 hours total. So far, the plants all appear to be thriving. It just goes to show you, that you should try some things out even if it isn’t the ideal condition for the plant. Especially for a container garden, which you can move into another location if you need to. Many tropical plants like moist, well-drained soil, so I have to keep an eye on it to make sure it doesn’t dry out. With the rain we’ve had over the last couple of weeks though, I haven’t had to worry about it.